Simple Vegetable Fried Rice Recipe | How to cook Basmati Rice ??? Who will say no to fried rice? It’s every ones favourite.It is very simple rice variety and easy to make.It is important to make the rice grainy for fried rice.If the rice turns stick,we won’t get it perfectly so i thought to post how to cook basmati rice before proceeding to the fried rice recipe. Wash and soak rice for 15-30 minutes before cooking.Drain the water completely.Boil 2 cups of water in a pan.Once the water gets boiled well,add in the drained rice.Keep the flame in medium and close it with a lid.Let it to cook.Once the rice gets cooked,switch off the flame then open the lid and fluff the rice with a fork . Keep the flame in medium while cooking because sometimes the low flames makes the rice sticky. Wash the rice and soak it for 15-30 minutes and drain the water. Add 1 and 1/2 cup water and rice in the vessel that comes with the electric cooker and switch on it. It will switch off automatically once it is done.This is the most simple and fast way of cooking basmati rice. 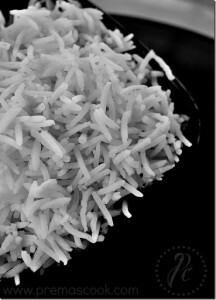 Choose the good brand of basmati rice,soak it at least for 15 minutes before cooking.It makes the rice to cook soon. You can add salt if you are not making any sweet use the rice. Always use fork to fluff the rice so that the grain do not break. Julienne cut the vegetables and make it ready.Heat oil in a wok.Reserve little spring onion for garnishing and add the remaining spring onion,chopped garlic,minced ginger,saute well. Add the vegetables and saute for few seconds. Add in the soya sauce,pepper powder,vinegar and soya sauce,saute well. Check above procedure to cook basmati rice and then add the steamed rice,mix it with sauce. Saute for few seconds and remove it from the stove. Garnish it with Spring onions. Here is the rice is ready.It goes well with all kinds of indo chinese or any gravy.Enjoy!!! Don’t add the hot steaming rice into the pan,once you cooked the rice let it cool down for sometime and then start making fried rice. Don’t saute the vegetables for long because the vegetables becomes too soft if you saute it for long. « Potato Masala(Masal) Recipe for dosa and Poori | How to make Masala dosai? Super tempting and inviting rice bowl ! just feel like digging straight into that plate. lovely..and nice post too. Looks so colorful and very very tempting.. 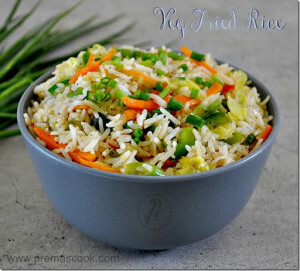 Delicious vegetable fried rice. Looks perfect. 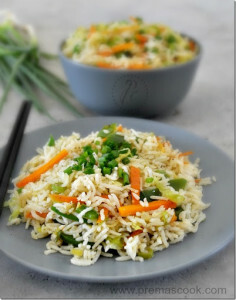 Prefectly cooked basmati rice, colourful and droolworthy fried rice. Perfect explanation for a perfect fried rice…am gonna try it now…literally…Thankx a lot!!! Perfect recipe for the perfect fried rice…am gonna try it now…literally..Thankx a lot!! !